Gartwo's Wrestling Figures-Hulkin' Up 24 hours a day. 12/16-Special Holiday-themed LJN ------------------Commercial available for download! 12/16-Added a new ToyBiz Prototype ---------------Sting pic to the Bendie Mecca. 12/16-Added the Sgt. Slaughter GI Joe -------------PVC to my collection! 12/16-Added a page for the OSFTM Mini -----------Belt Buckle Playsets. 12/16-Added the HG Toys Zipper Pulls to ----------my collection! Hello and welcome to Gartwo's Wrestling Figures. You have stumbled upon a plethora of wrestling goodness! I'm a long time wrestling fan and have amassed a pretty decent collection of wrestling figures over the years. I've put a lot of time and money into my collection so I figure I may as well share it, and all the information gathered along the way, with the rest of the world. You won't find many of the "usuals" (Jakks, Hasbro, 8" LJN) here. My collection mainly consists of the lesser collected and more obscure wrestling items such as Bendies, PVCs, & Thumb Wrestlers. All the pictures of my collection are divided into three main sections: The Bendie Mecca, The Rock n Wrestling Eraser Connection, and Parts Unknown. You can read more details on each section below. In additon to showcasing my collection, there are also many more features here for you to enjoy. Sell and trade at The Store or download some vintage wrestling-related TV ads in the Old Commercials section. Also, i've added the special Main Event section to the site. Every few weeks or so (whenever time permits) i'll write a different wrestling-related "essay" of sorts for your viewing pleasure...or at least for my writing pleasure. I love talking to and trading with fellow collectors, and thanks to this site I've gotten the opportunity to meet several new folks out there in internet land who share my collecting interests. So, please feel free to drop me an email with feedback, questions, or anything else wrestling related. I look forward to hearing my visitors' thoughts on the site. Thanks for stopping by and come back soon! 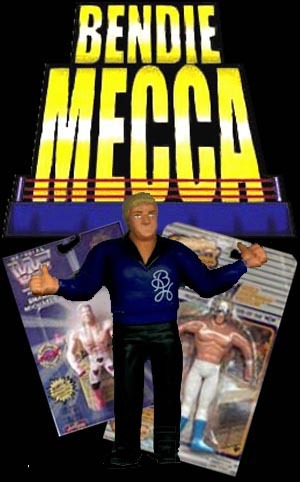 The Mecca is where you'll find all the info and pictures you'll ever need of practically every "bendie" figure line ever produced! This set of erasers is the pride of my collection. It's one of, if not the rarest line of wrestling figures ever made! Here's where you can see all the other odds and ends of my collection. PVCs, Thumbies, Stampers, and oh so much more! If you're looking to buy, sell, or trade, this is the place to be. See my entire list of inventory i'm willing to unload, my "Most Wanted" list, and check out my current eBay auctions. In addition to collecting wrestling figures, I also collect old commercials. Here you can download several vintage ads featuring wrestling products, or with wrestlers as the pitchmen! 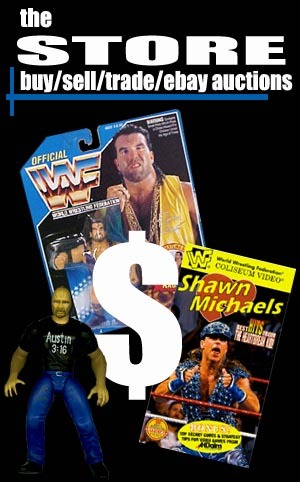 Please click here to check out several other great Wrestling Figure websites, and find out how your site can become part of Gartwo's Link Exchange Program!